Welcome to the Counterfeit Kit Challenge for December and we are so excited to share our Christmas build-up with all our followers. True to previous years, we've decided to shake things up a little and we hope that our daily posts throughout the month will inspire you to get out some of your own Christmas stash and turn it into memories of past, present and even future! So, what are we up to this month? 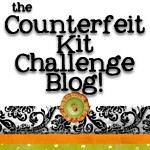 Well, we decided to celebrate A Counterfeit Kit Challenge Christmas Carol! Yes, you may be scratching your head and wondering what on earth we're talking about so let me help. A Counterfeit Kit Challenge Christmas Carol - The memories of Christmas past. The idea in this post is to show you a small page kit turned into a Christmas memory from the past. We know how hectic these weeks can be so we'd like to inspire you make something quick and easy - something that you might be able to use for any of the many December projects around or just your regular December scrapping or pocket page memory keeping. 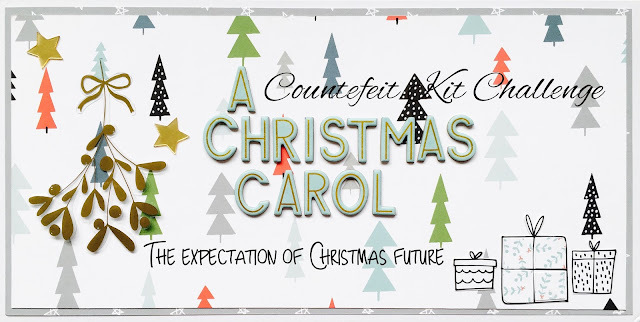 A Counterfeit Kit Challenge Christmas Carol - The followers of Christmas present. This is where we'd like to highlight a few of our faithful CKC followers who have taken up our challenge of making their own kit from their own much loved supplies and have contributed to our community. Each of the Master Forgers have picked one or two members to give a loud shout out to and this is our way to say Thank You to ALL of you out here who've been with us all year. A Counterfeit Kit Challenge Christmas Carol - The expectation of Christmas future. Each of these posts will talk a little about what we are hoping for scrappy-wise or creatively in the year to come. We might be sharing our present wish lists, our resolutions for the new year, maybe our OLW or even our creative plans for 2017. We hope that you will find something to add to your own letter to Santa or creative goals for the year to come. And there you have it. As of tomorrow, for the next thirty days, we'll be right here, sharing our Christmas thoughts with you. Of course, it's SO much better when all of YOU are there with us and we hope that you will continue to show us your own creative projects through December on our Link Up page. There's no member blog hop this month but we hope to be back with it in January - we are just setting up our CKC goals for the new year so let's see what 2017 will bring for us as well. So, come back tomorrow to see what Master Forger Susanne has for us! How exciting....a post a day! It will be my secret little indulgence to follow along; every day that I can.